We mAy NoT hAvE It All TogEthEr, bUT TogeThEr We hAvE It All!! I am selling Scentsy now. If you are interested in HOSTING a Party, or taking my Scent Basket and doing a BASKET Party. Please Let me know!!! Wowsers.... finally a new entry! This year is already passing with flying colors! I can't believe that it is already March. There are soooo Many things that have gone on since the begining of the year. Let me catch you up! January..... KORBIN turned 1 !!! Celine Dion concert was finally here!! She is sooo freakin amazing I can't stand it! The Concert was amazing! Her voice is UNREAL.. i could listen to her sing live everyday.. for the rest of my life. ok I know that's a bit much but she sure can SING!! I can't believe how fast the last couple of months have past! I hope that you all have had a great start to 2009.
holy moly...I was beginning to wonder if you remembered that you had a blog ;) just kidding, but looks like you guys are still doing great! I wish so bad i could have gone to that! I bet is was amazing! k so jealous you got to go to her concert!!! She really does have thee most amazing voice!! I also love, love your hair!!! it is so cute!!! They GROW so fast! Can't believe it how time flies! You know I completely AGREE about Celine! For the last few weeks I have been listening to her nonstop! New Warmers.. they are so cute! We met in Jackson Hole WY 5 years ago. The minute that we met we knew that we wanted to share the rest of our lives together. So 6 months after meeting we married. We got Married August 28, 2004. In the most amazing Garden Wedding in my parents back yard.This year we going to be celebrating our 5 year anniversary! Some days it feels like 4 years and some it feels like 10. (just ask him)We have so much fun together and we still know that we were soulmates!! We are so excited to share all of lives experiences together!! 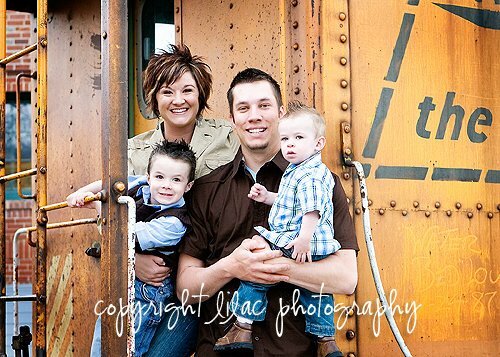 I am a mother of 2 beautiful boys, and a wife to the most amazing man! We love spending anytime that we have with eachother. My husband is the most amazing thing that has ever happened to me... well besides the beautiful children that followed! We can't believe that it has already been 4 years... but it has been the BEST 4 years of our life!! Life is a great bundle of little things! our simple, fun, and joyful life!